It's quite amazing the boom there has been in personal cameras. Action cameras for sports and dashboard cameras for personal use have become so widespread they are almost ubiquitous in some countries. You only need to see the number of Russian traffic accident videos on YouTube to realise how revolutionary compact camera technology and solid state memory has impacted on our lives. Thats where this little action camera comes in. We've seen many a 'Go-Pro copy' come through our purchasing department inboxes, but this one looked the goods. Not only was the price right, but it offered full HD recording from a unit that weighs just 24 grams! Outside of its waterproof casing, its about the height of an average USB flash drive, but a bit thicker. It offers 1080p high definition recording, plus a low resolution mode to increase your recording time, which can be selected at the flick of a switch. The in-built Li-Ion battery offers up to 2 hours recording time and recharges via USB. It can be up and running again in under an hour. Theres no real limit to the types of action you can record with it, we've even strapped it to an RC plane (see below). 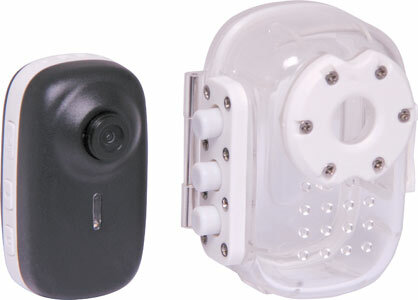 It comes supplied with a helmet strap, bar mount and neck hanging strap. All of these can be used with or without the waterproof case, as needed. The case is waterproof, but only to 20m, so its ideal for snorkelling on shallow reefs, but don't be trying any free diving world records!. Our QLD office manager recently took his RC plane out for a fly using an X 0684 attached to the front. The result is this slightly motion sickness inducing YouTube video. The X 0684 is available here, through our resellers or for purchase in-store for RRP $135.